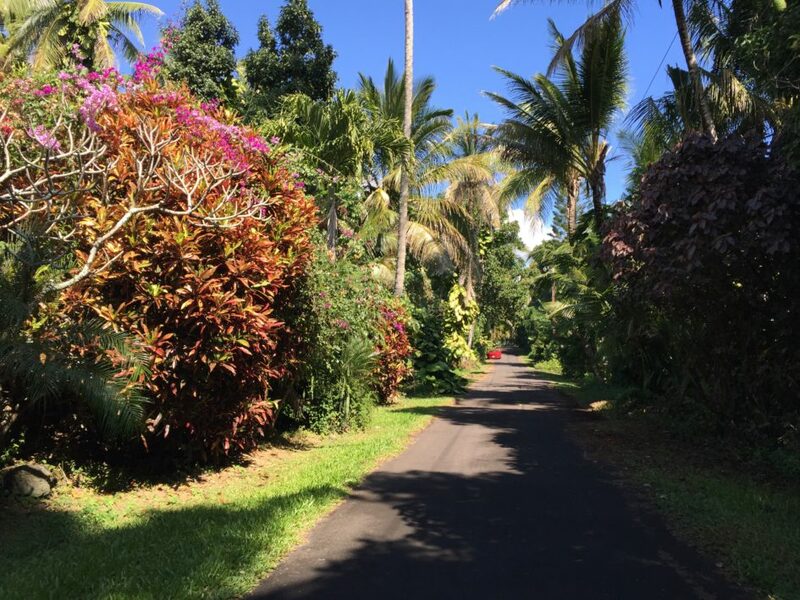 Living on the Big Island, you will encounter insects, amphibians and reptiles, and the occasional wild boar (however, NO snakes!) that call this environment home. We have included a few of our islands little inhabitants that, you will likely encounter while you visit Hale a Kimo Kali and the surrounding area. 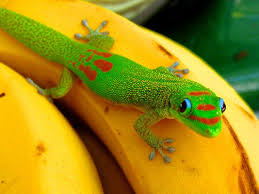 The Gold Dust Day Gecko (who resembles the Geico Insurance character) is a spectacular lizard. This lizard is totally iridescent with vivid bright colors. It can grow to be 4-5 inches long. This gecko is harmless and very helpful in Hawaii at keeping insects at bay. Hawaiian folklore states that it is actually good luck to have them around your home. On the mainland, some people keep these geckos as pets. On occasions, one does sneak into the house. Keeping screen doors and window screens closed tightly will help prevent them from sneaking in. We keep a net behind the door to help aid in catching one that might let itself in. Don’t try picking one up by its tail. As a means of escape, it will separate its tail from its body if it feels threatened. This doesn’t harm the gecko and it will grow back. Here at Hale a Kimo Kali you will see them sunning themselves on plants and on our lanais. 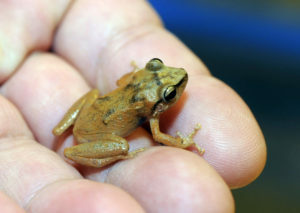 The coqui frog was accidently introduced into Hawaii from a plant shipment from Puerto Rico. It has come to like this environment and is multiplying at a fast rate. They grow about 1-2 inches in size. For a small frog it has an amazing appetite and eats any small insect, which is a benefit to every homeowner here on the island. As dusk falls be prepared for their mating calls to begin. Some visitors might find their nightly chirping annoying, others actually find it soothing. The green anole is a lizard that actually changes color from green to brown and can grow up to 5-9 inches long. This lizard is harmless and is common in backyards and gardens here on the island. It enjoys eating lots of insects which is helpful for the homeowner. They enjoy sitting and soaking up the sun on broad leaves and you will occasionally find one or two sitting on our lanai railings. 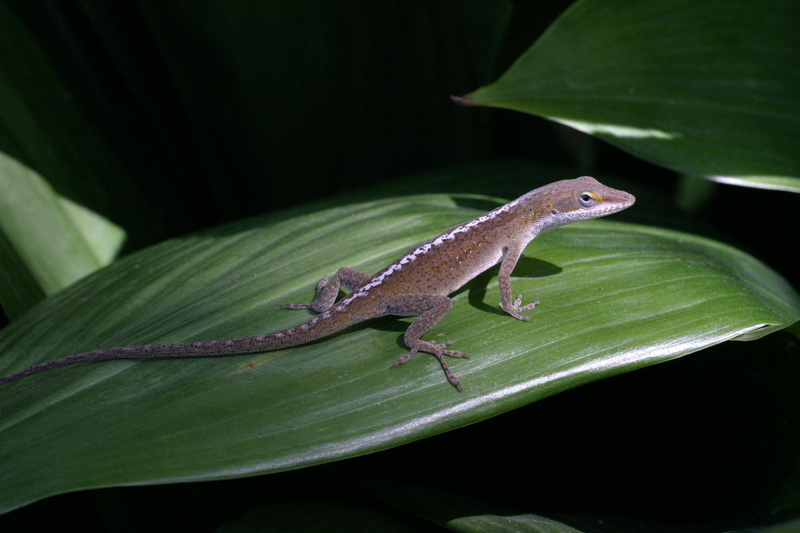 If you are on the lanai and enjoying a piece of fruit, should you leave it unattended, don’t be surprised when you return to see a gecko or green anole sampling it. 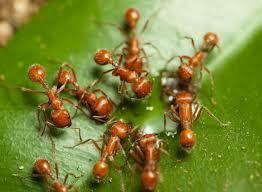 This is a small ant and its color varies from yellow-red to light brown in appearance. It is about the size of a sesame seed. They live high up in the trees, are slow moving and can easily be dislodged from leaves just by a breeze. For some individuals they can deliver a painful sting when disturbed. To avoid encounters, we suggest you refrain from venturing into the dense jungle abutting the property. We and other homeowners in the neighborhood have our properties treated by a professional on a regular basis to help control these ants. Texans love their cattle and Hawaiians love their pigs. Millions of visitors to the islands have attended luaus where a roasted pig in the ground is considered a must see event. 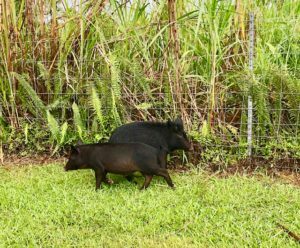 Here in Hawaii feral pigs are also known as wild boar or pua’a (Polynesian for wild pigs). Hawaiian lore has it that the pua’a were associated with various Polynesian gods and they were treated with great reverence and respect. Some homeowners and ranchers here on the island find that these pigs can be a nuisance and destructive. They forage for vegetation, roots and worms by rooting in the ground. This action destroys vulnerable native plants and crops. During your stay here at Hale a Kimo Kali you might see a pig in the neighborhood, encounter one during your travels or on the menu at one of the islands restaurants. These pigs usually avoid humans and are not typically aggressive when wallowing and rooting for food. Do not approach them.